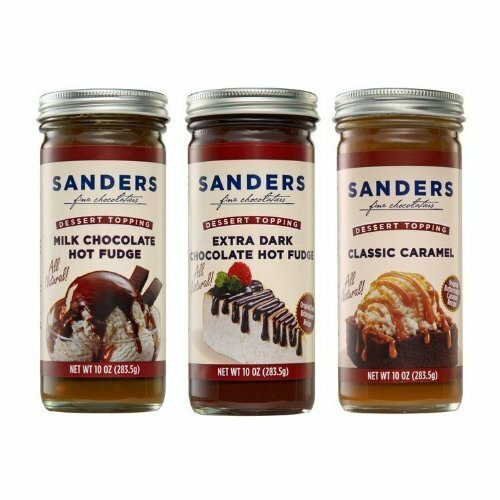 For over 130 years, Sanders has been bringing generations of chocolate lovers together with an irresistible collection of candies, cakes, chocolates, ice creams and dessert toppings. The original, award winning "hot fudge" is a real crowd-pleaser. Certified Gluten Free, All Natural and Kosher. Creamy caramel with a hint of butterscotch. Perfect on Apple Pie or as an Apple dip. Certified Gluten Free, All Natural and Kosher. Formerly named Butterscotch Caramel. The original, award winning "hot fudge" is a real crowd-pleaser. Creamy caramel with a hint of butterscotch. Perfect on Apple Pie or as an Apple dip. Extra Dark Chocolate Hot Fudge ~ Rich, dark fudge with a strong cocoa flavor. View More In Ice Cream Cones & Toppings. If you have any questions about this product by Sanders®, contact us by completing and submitting the form below. If you are looking for a specif part number, please include it with your message. Gold Medal World's Greatest Apple Topping - 66 ozs.